Historic Devonport park is a treasure. It is Victorian and grade II listed. Established in the late 1850s it was the first park dedicated for public recreational use in any of the three towns (Devonport Plymouth, Stonehouse). The parkland at that stage arced fully around Devonport, hence the term often used - 'Devonport's Green Arc'. Originally under military control, the land, immediately outside the town's garrison walls, was used for training army personnel. The Army continued to use the land for many decades even after it was designated public parkland - initially to continue their practice drills, but eventually for recreational use. Blending in with the community, Devonport's military bands provided music regularly from the bandstand - afternoon music in the park was very popular. 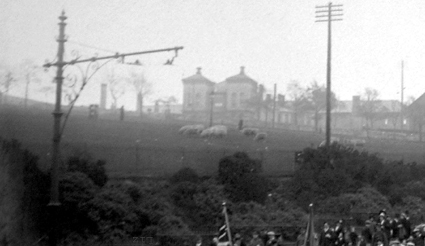 photo: Sheep grazing on the park, New Passage Hill end. In the background is the Royal Albert Hospital. Image taken sometime between 1900 and 1914. 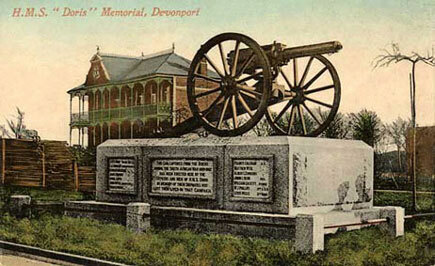 The Doris Gun, seen here in this postcard, is probably the most well-known of the park's features. The gun was captured from the Boer war and brought home to Devonport aboard HMS Doris. The ship's crew subscribed to have the gun set as a monument in honour of their colleagues killed in the war - it was installed in its present site amidst a local ceremony in 1904. In 2007 the gun was professionally restored and now looks very attractive. The Napier Fountain, described here, is visible from Fore Street, being located just a few yards from the lower lodge; it was erected in 1863 in memory of Admiral Sir Charles Napier (1787-1860). The Great War Memorial was constructed in 1923 and commemorates Devonport men who fell in the Great War - it is described on this page. The Lower Lodge (page to follow), is located at the Fore Street entrance to the park; it is a grade II listed building. The Gas Cleansing Centre is located at the north-east corner of the park, near Exmouth Road. Designed as a cleansing centre in WWII, in case of gas attacks, the building was probably never used for that purpose. It languished unused for several years, but for the last decade has been used by the Plymouth Model Railway Club. Air Raid Shelters. There are two known underground Air Raid shelters within the park grounds, from WWII (a web page describing is to follow). The Galatea Obilisk is visible from Fore Street, being 50 metres west of the Lower Lodge, but you may near to peer as sometimes it becomes hidden by bushes. The design and layout of the park took full advantage of the stunning views enjoyed in Devonport. From the eastern section of the park the views are towards Mount Edgecumbe, and of the river Tamar ending its journey at Mount Wise as it meets the waters of Plymouth Sound. From early postcards can be seen the full beauty of that view, but over the years additional tree-planting, although well-intentioned, blocked the vista. Thankfully The Friends of Devonport Park are addressing this issue at present and hope to restore as much of that view as possible. From the western section of the park the view is often a busy scene. You have to go look, especially if you've just moved into Devonport - you'll be well pleased. A good spot is near the new wildflower meadow, (where the sheep graze in the image above) located at New Passage Hill, this will give you a grandstand view. Stretching before you will be a section of the river Tamar called the Hamoaze - the Hamoaze is the reason why Devonport exists. Devonport Royal Dockyard will be busily going about its operations below you, with the great ships of the Royal Navy in view. The loveable ferries between Devonport and Torpoint will be tracking their way to and fro across the Hamoaze. And behind all that, forming a beautiful backdrop, you will see the green hills of Cornwall. Go and have a look. Hope you enjoy the wildflower meadow, that's a recent feature of the park, again from the efforts of The Friends of Devonport Park . £5.3 3million of funding was awarded to The Friends of Devonport Park by the Heritage BIG Lottery Fund, Plymouth City Council and Devonport Regeneration Community Partnership. The funding was used to transform the park and restore it to its former beauty. Much work is to be carried out, indeed it has already started; not just on the lower lodge as mentioned above, but also on a modern new play area and a purpose-built refreshment centre. There is also a study being carried out on whether a new bandstand is feasible - it would great for the park if this project went ahead. Plymouth City Council have made park planning documents available online, on their Planning pages, and The Friends of Devonport Park produce their own Newsletter which can be downloaded by right-click here and choose 'save as', or from the web site of The Friends. The Devonport Park Voluntary Gardening Club would be delighted to hear from anyone wishing to volunteer. If you are interested in joining please contact Mike Gallagher on 01752 213308 or by email, mikegallagher@friendsofdevonportpark.co.uk Alternatively contact Chris Coldwell on 01752 305598 or by email, chris.coldwell@plymouth.gov.uk It is hoped that volunteers will be able to attain NVQ qualifications in the near future through Duchy College; this is an ideal opportunity for anyone interested in horticulture to take that first step. The friends will be holding their popular “Music in the Park event on Sunday 13 September 2009. The theme for this year will be loosely based on the 1940's era. This was chosen because of the interest generated by the recent discovery of the wartime air raid shelters in the park. Mike Gallagher, Chair of Friends of the Park said "This year, we are not only raising funds for the Friends, but the proceeds on the day will be split between us and the charity, 'Help for Heroes'. We have available draw tickets which will shortly go on sale in some local shops at 20p per ticket. First prize is a return ferry crossing for two to France on Brittany Ferries (value £200). There are also cash prizes from £100 down to £25 and many other prizes as well. We have displays booked from Dartmoor Wildlife Park, the National Marine Aquarium and Plymouth City Museum, plus there will be donkey rides, fairground carousel, Punch & Judy, Circus skills show & workshop, Dog Show, Music Makers (for younger children), birds of prey, live music, tombola tables, various refreshments (including cream teas) and lots of stalls and games". Napier fountain erected in 1863 in memory of Admiral Sir Charles Napier (1787-1860).